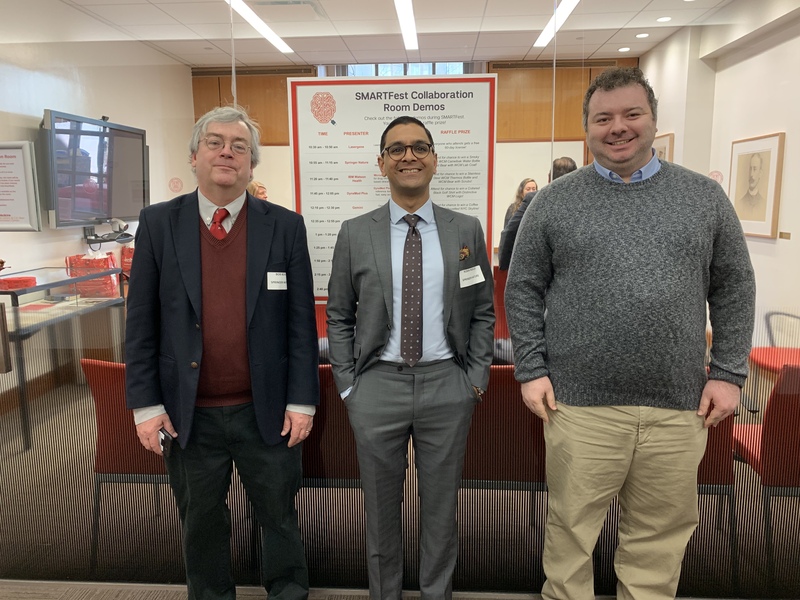 The first event of 2019 for the Springer Nature Experiments team was also Springer Nature's first visit to Weill Cornell Medicine's very popular SMARTFest. Despite being based in New York and often traveling for conferences and meetings, I somehow rarely attend events in New York itself. 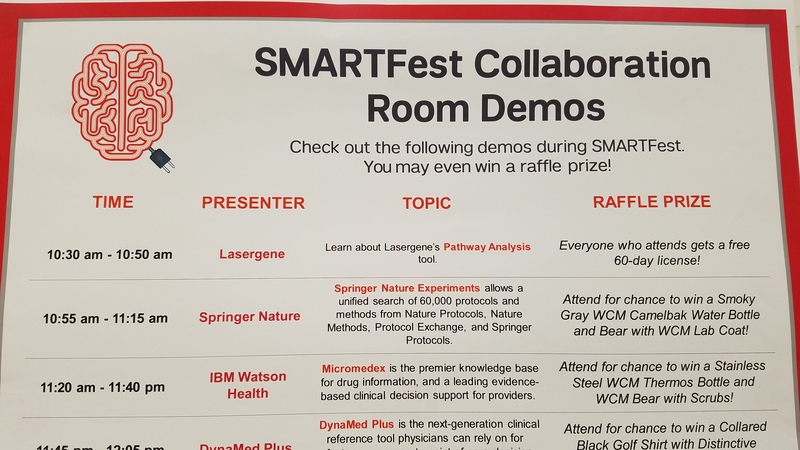 In light of this odd situation, I was excited to learn that Springer Nature had been invited to the 2019 edition of Weill Cornell Medicine's SMARTFest. The SMARTFest, organized by WCM's Samuel J. Wood Library and the Information and Technology Services department, started in 2013. SMARTFest quickly established itself as a very popular event with about 1,000 attendees from WCM's students, staff, and faculty. SMARTFest showcases a variety of technology-focused tools, resources, and services. One of the many activities at SMARTFest is the demo session, where I gave a talk about Springer Nature Experiments. In my presentation, which was also live streamed on the Wood Library's Facebook page, I discussed the challenges of navigating through large amounts of scientific content specifically trying to find and evaluate relevant protocols and methods. I then briefly explained how we built Springer Nature Experiments to address these problems and showcased searching and browsing protocols and methods with Experiments. The presentation was very well received by the in-room attendees. But this was only the first part of the SMARTFest. 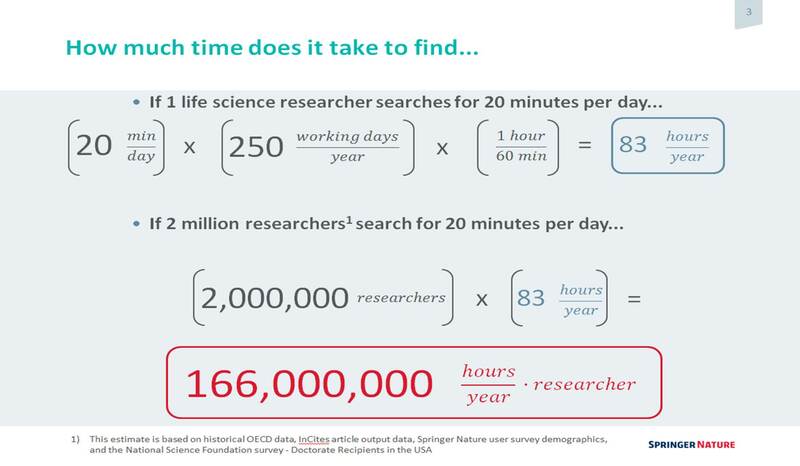 Slide from my talk estimating how much time is spent (wasted) searching specifically for protocols and methods. After the presentation, I was on booth duty with my other Springer Nature colleagues. We had many great discussions, chatting with many students, faculty, and researchers about Springer Nature Experiments, searching for information, finding the right protocol when you need it, and other related topics. The SMARTFest was a wonderful event to be a part of and it was a great pleasure to participate in it. A big thanks goes out to Terrie Wheeler, director of the Weill Cornell Medicine's Samuel J. Wood Library, for the gracious invitation. A big thanks also goes to my colleagues, marketing coordinator Sarah Lu, account manager Chris Braca, and especially to Bob Boissy, director of institutional account development. We look forward to attending SMARTFest again next year!